There’s a lot to talk about regarding Miami’s 4-1 loss to UND in Grand Forks last night. Suffice it to say, we’ll be watching these over the coming days and weeks. 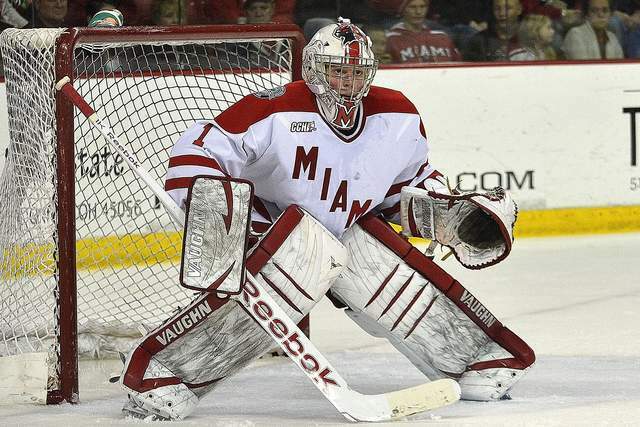 – Goaltending: Ryan McKay was again average at best in net for Miami. His season line now looks like this – 0-3, 3.59 GAA and .897 save percentage. 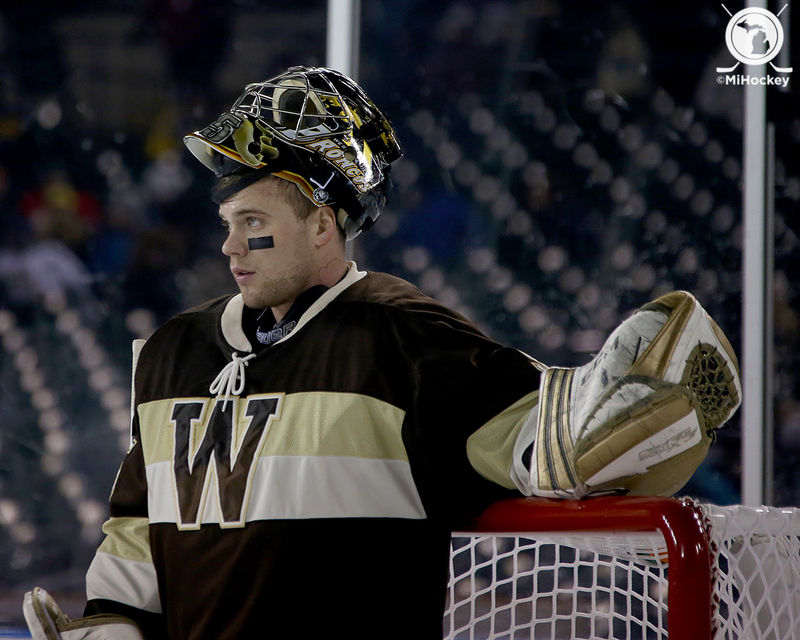 Simply not good enough to be considered a top flight goaltender in the NCHC and certainly not good enough for a team that has national title aspirations. While that’s a relatively small sample size, to the eye, McKay hasn’t looked like what we’ve come to expect out of a Miami goaltender in over a year. – Officiating: We don’t complain about the officials because it’s pointless and comes off as whining, BUT, how the heck did they determine that Cody Murphy’s goal that would have put Miami up 1-0 in the 2nd period should be overturned? To me, the puck was over the line before the contact and it looked as if UND’s McIntyre kicked it in of his own accord. There were certainly some other questionable calls that went against Miami last night, but again, it’s pointless to whine about it. It’s the same for each team over the course of the season. – Coaching: Starting Ryan McKay in a HUGE road series as hot as Jay Williams has been, has to be questioned. I know what Blasi was thinking (you have to give McKay another chance if he’s healthy) but it was a costly decision because McKay did little to further the cause outside of a good 1st period. UND started their best on both nights. – The stars: Senior captain Austin Czarnik and sniper Riley Barber returned to campus for a reason. Their play thus far has me confused as to what that reason is. Both players were shutout, read – didn’t record a point, this weekend. That can’t happen. The two of them have to carry this team especially against top competition. Czarnik was absolutely invisible all weekend and Barber looks lost. They must be Miami’s best players — along with junior Sean Kuraly who certainly did his part on Friday night and senior Blake Coleman who while held off the scoresheet was his usual disruptive self at times returning after a week off due to illness. – Defensive zone turnovers/losing puck battles: Yep, those reared their ugly heads last night as Miami was losing puck battles and turning the puck over in their own zone. Sooner or later, we need to be taking the body rather than allowing players like Drake Caggiula to embarrass the team over and over. Caggiula is a player that had 19 goals in his first two seasons at UND. This isn’t Johnny Hockey and we continually make him look like he’s a top flight prospect. All is not lost. But, Miami must begin to pick it up as we get closer to the new year. Thankfully, they’re in a good spot at 8-4 overall and 4-2 in the NCHC. But, as you may recall, it was at about this point last season that things went awry and the wheels fell off big time. Will they avoid some of the same mistakes that plagued last year’s team, or was last night a predictor of things to come? In a battle of top 10 teams, the seventh ranked Miami RedHawks outlasted second ranked North Dakota in Grand Forks by a 3-2 score. The RedHawks (8-3, 4-1 NCHC, t1st) were once again led by the tandem of junior forward Sean Kuraly (2-1-3) and junior net minder Jay Williams (21 saves) as Miami has now won three in a row for the second time this season. For Kuraly, it was his sixth game-winning goal. Miami has eight wins on the season. That’s a pretty amazing stat this early in the year. And, for Williams, it was his eighth win of the season as he pushed his record to 8-1 as Miami’s primary keeper of the crease so far this season. Michael Parks and Drake Caggiula scored for North Dakota (7-2-1, 2-1 NCHC, t4th). This game featured a total of 20 penalties (12 by Miami) including game misconducts to UND’s Colten St. Clair and Miami’s Matthew Caito each for grasping the facemask during a first period scrum that was essentially started when Miami senior forward Blake Coleman was called for goaltender interference at 16:45. The teams settled down after that and played hard throughout the remainder of the night. face-off when he pounced on a puck in the corner and beat UND junior Zane McIntyre inside the post. Kuraly and Anthony Louis assisted on Gacek’s first goal of the season. Sean Kuraly was involved again scoring his 8th goal of the season when he and Gacek executed a 2-on-1 to perfection while shorthanded. Gacek brough the puck up the left wing and moved the puck to Kuraly who easily beat McIntyre to give the RedHawks a 2-0 lead with 15:45 left in the first period. North Dakota would get on the board late in the period, but Miami carried a 2-1 lead into the first intermission. Striking quickly, UND’s Drake Caggiula tied the game shorthanded just 1:22 into the second period. But Kuraly would strike again for Miami on the power play at 6:50 when he was the recipient of a perfect bounce of the back wall following a point blast by freshman defenseman Scott Dornbrock and he quickly beat McIntyre who was recovering from the point shot. In the third, Miami simply packed it in. I might say they packed it in a little early as the ice was tilted in UND’s favor. However, Miami blocked several good UND shots and though Jay Williams was credited with only five saves, it seemed that he was busier than that as North Dakota pushed for an equalizer they would not find. In his postgame press conference, Miami head coach Enrico Blasi was pleased with his team’s overall effort on the night. Miami was close to putting the game away late in the third. With UND’s Zane McIntyre to the bench for the extra attacker, Miami did a good job of moving the puck quickly and getting clears. Junior Riley Barber and senior Austin Czarnik both had looks at the open net, but somehow UND got bodies in front of the net and kept the puck out. The RedHawks will go for their first-ever sweep of North Dakota tonight at 8:07 PM. The game might be on Fox College Sports and will definitely be available via NCHC.tv. Greg Waddell will have the Miami call at Miami All-Access, 1490-AM WKBV and via the Tune In app on your smartphone. – UND saw the return of both sophomore defenseman Paul LaDue and senior Mark MacMillan to the lineup after playing games about their availability all week. – Miami once again hit the 30 SOG mark firing away, especially during the first and second periods when they rang up 15 and 11, respectively. But, the four shots in the third period was an indicator of just how much control of the game UND seized as Miami held on for the victory. – With the win, Miami snapped UND’s 8-game unbeaten streak since dropping their opener 5-1 to Bemidji State. – Miami snipers Austin Czarnik and Riley Barber were held off the scoresheet last night seeing a rare goose egg thrown at them by the UND defense. However, Barber led Miami with 5 SOG. – Miami announced before Friday’s game that sophomore Trevor Hamilton has elected to leave the team and return to junior hockey. Not sure if that means USHL or if he’s going to try the CHL, but based on his play at Miami, I can’t believe the CHL would be interested. If the early lines were any indicator, he wasn’t likely to play much this season, but shortsightedness (e.g., get your damn education — unless there are other college aspirations) appears to have claimed another one. After a week off due to #lifeandstuff, we’re back with a preview of this weekend’s huge NCHC series against North Dakota in Grand Forks. In what is shaping up as one of the biggest series of the season thus far, #7 Miami (7-3, 3-1 NCHC) visits second ranked North Dakota (7-1-1 , 2-0 NCHC) hoping to avenge last season’s dismal sweep at the hands of Gang Green. As you may recall, that series in February featured a 9-2 UND romp a night after Miami dropped a close 3-2 decision at Ralph Engelstad Arena. Miami trails the all-time series against North Dakota by a 2-5-1 margin and has never won at “the Ralph.” However, Miami did pick up the program’s first two wins over UND by beating them once in Oxford and also in Minneapolis in the league tournament semifinal 3-0 last season going 2-3 against the green and white. a resume that almost anyone would dream of. Hakstol has led UND to six Frozen Fours, has captured four WCHA Final Five playoff titles, two WCHA regular season championships and has taken UND to the NCAA tournament in each of his 10 previous seasons as head coach. When you’re the head coach of the 7-time national champions with the largest and most vocal fan base in the nation, and that program hasn’t won a national title since 2000, the natives can be a little harsh on you. 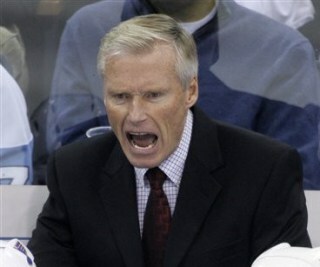 Hakstol has endured cat calls demanding his firing in seemingly every season that I can remember simply because he hasn’t won the big one…yet. As a Miami fan, I think we can all relate having been so close to a national title in 2009 and then returning to the Frozen Four a year later only to experience even more disappointment. As successful as Enrico Blasi has been at Miami, he like Hakstol, has yet been unable to get his program over the hump. With that sort of success, however, I think Hak deserves a break even if he can be one of the most childish fellas you’ll see behind the bench of a collegiate sports program. Interestingly, Blasi will be speaking alongside Hakstol at UND’s Fan Luncheon tomorrow at noon CST. I’ve always sensed good competitive tidings between the two men and I think anything each can do to further the growth of college hockey and the NCHC can only be a good thing. Plus, they’re two Canadian boys so there’s that. After dropping its first game of the season at home to Bemidji State, North Dakota has run off an eight game unbeaten streak including a sweep of Wisconsin (0-6) last weekend in Madison. In addition to the Badgers, who are awful (as is the Big 6), UND has beaten the likes of Bemidji State, Air Force (who just lost to UAH) and Colorado College (twice – sweeping them just like Miami did last weekend). The only quality win UND has to date is a 6-1 thrashing of Providence in Grand Forks. Interestingly, the Friars came back the next night to tie UND so their schedule has been light at best so far in the season. And for Miami, if there ever was a weekend to face UND, it might be this one as the injury bug has really struck Gang Green. Already without standout sophomore blueliner Paul LaDue (3-5-8) who injured a leg last Friday and did not suit up for Saturday’s game against Wisconsin, UND will also be without the services of uber freshman Nick Schmaltz (1-7-8) who was named the NCHC rookie of the month for October. Adding to UND’s injury woes, Miami killer senior Mark MacMillan has been out of the lineup for the past four games but yesterday, UND beat reporter Brad Schlossman hinted that maybe MacMillian (5-2-7, 5 games) might be ready for Friday night’s game — and just in time if you’re a UND fan. Aside from MacMillan and Schmaltz who were off to great starts, UND is led by elusive forwards, junior Drake Caggiula and senior Michael Parks, both 3-8-11 in 9 games. Gone are both Rocco Grimaldi and captain Dillon Simpson from last year’s Frozen Four squad while junior Jordan Schmaltz (1-4-5) leads the blueline taking over a leadership role for the green and white. Overall, it’s a very deep and talented roster that Dave Hakstol has assembled. A glance at the roster shows this is not an overly big UND lineup, but most of the skaters hover around 6′ tall which will still be challenging for some of Miami’s smaller forwards like Anthony Louis, Alex Wideman and Cody Murphy. But, I think Miami matches up much better than last year with the additions of Andrew Schmit, Conor Lemirande and Scott Dornbrock. With those three plus Kevin Morris patrolling the ice, Miami should not go into the Ralph feeling intimidated one bit. In net, UND returns junior Zane McIntyre (formerly Zane Gothberg) who has started right where he left off last year sporting a sterling 7-1-1 record with 1.94 GAA and .927 save percentage. But, Miami has gotten to McIntyre beating him in Oxford and also at the Frozen Faceoff in Minneapolis. In fact, McIntyre’s GAA against the RedHawks is around 3.33 and he was rocked by the RedHawks early last year and again in the NCHC semifinals in March. That said, McIntyre is an outstanding goaltender and to beat him, Miami will have to continue to generate shots and quality chances from throughout the lineup as they have versus nearly every opponent so far this season. These are two good teams. With UND’s injury situation, it’s hard to see them sweeping Miami, but if any team can dig deep and get it done on home ice, it would be the green and white. On the other hand, because of the injuries I really want to pick a Miami sweep. All that said, I’ll take a split with Miami picking up another NCHC road win. Both games can be seen on NCHC.tv and Saturday’s game will be carried nationally on Fox College Sports. Greg Waddell will have the Miami audio call at Miami All-Access and he can also be heard via the Tune-in app on your smartphone. Twitter, smartphones and the interwebs have been godsends to college hockey. By the sound of things emanating from Duluth’s Amsoil Arena last night, the officiating was the only difference in Miami’s 3-2 victory over UMD. Never mind the 38-28 shots advantage for the RedHawks. Disregard that power plays were relatively even – 8 chances for Miami, 6 for UMD. Forget the ridiculously lucky no-look, behind-the-back glove save on a sure goal from Miami’s relentless Cody Murphy. Deny the 5 of 6 penalty kills from the RedHawks defense. And, surely wipe Jay Williams’ 12 saves on 13 first period shots from your memory when Miami was struggling to find their legs. Yeah, it was all officiating. But, if you read the comments from the Bulldogs in this poorly written Duluth News Tribune article, well, that’s the only reason Miami was lucky enough to win. 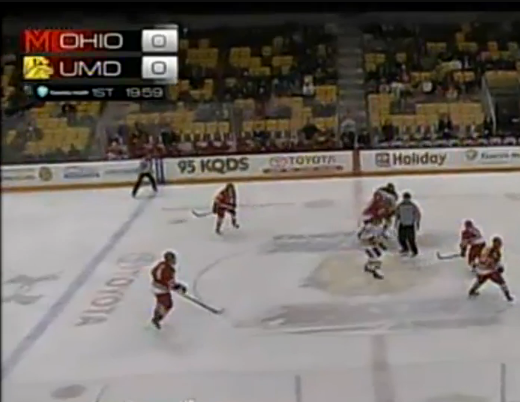 Apparently, the Bobcats of Ohio University were UMD’s opponent in front of dozens of fans last night at Amsoil Arena. and its beat reporter. But, that’s what Saturday’s are for and Duluth is 3-0 on Saturday nights this year. Of course, Miami is too, but that’s beside the point. UMD will have an opportunity to show that it was all officiating. Miami will have a chance to a get a NCHC road series sweep. I don’t think I have to tell you that they didn’t do that all of last season. The puck drops at Amsoil Arena at 8:07 PM EST. Pass the popcorn. Enjoy the butthurt!